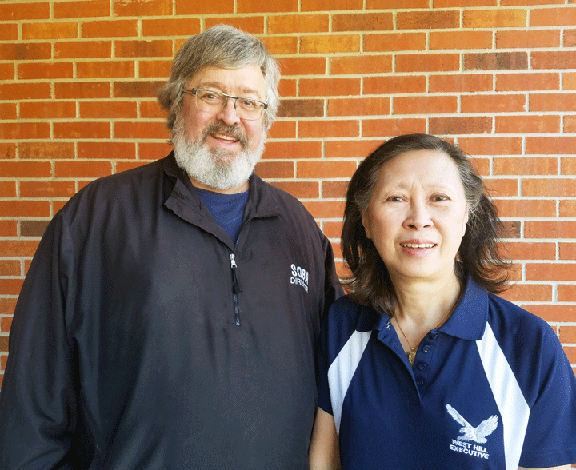 Dave Black, president of the Toronto Baseball Association, and Angela Ayoung-Chee, secretary of the West Hill Baseball League, are longtime baseball volunteers. Whenever the Blue Jays do well, local baseball gets a boost. Right now, baseball in Toronto has a higher number of registrations than when the Blue Jays won the World Series in ’92 and ’93, said Dave Black, president of the Toronto Baseball Association and commissioner of the Select Division of Baseball Ontario. Both are volunteer positions for this Centennial resident who is passionate about the sport. “Back when they won the World Series, we had our highest numbers ever,” he said. “When I joined West Hill in 2003, everyone referred to those days as the ‘halcyon days of baseball’ because we’ll never hit those numbers again.” Now they’ve exceeded those numbers as a result of local leagues building more robust programs and the Jays doing well again a few years ago. Registrations in the West Hill league have been increasing year after year, Dave said. Last year they had close to 500 players. There are 14,000 players across the city. The West Hill Baseball League is a non-profit organization run entirely by volunteers. West Hill is one of four leagues in the Scarborough/East Toronto area. The highest competitive level of youth baseball in this area is operated through the Scarborough Stingers, the Scarborough Rep organization. The Scarborough Baseball Association put together the Rep program so that the strongest players from the four leagues combined would be able to play at a more competitive level. West Hill offers house league and Select baseball programs to youths from age 3 to 19. Players start out in house league and as they move up, the more competitive ones can try out to play on Select teams. “It’s like house league all-stars,” Dave said. They will play extra games against Select teams in other leagues, but they still play house league. Select starts at Rookie Ball (ages 8 and 9). Players are assigned to a division based on their year of birth. Blast Ball and T-Ball are for the younger children (ages 3 to 7). In West Hill, there is no scorekeeping at those levels. Rookie Ball contains most elements of standard baseball with a pitching machine. In the older divisions (Mosquito, Peewee, Bantam and Midget), players get a chance to develop pitching skills. “Our biggest challenge is that we’re running out of diamonds,” Dave said. In West Hill, the league uses city and TDSB diamonds. The baseball league works with the city and the TDSB to ensure that the diamonds are in good shape. Another challenge is getting coaches, Angela Ayoung-Chee, secretary of the West Hill Baseball League, said. “Some parents are understandably reluctant to become coaches, for various reasons, but we manage to persuade some of them to step up.” The league provides training to its coaches and it is grateful to all those who volunteer their time. And when the players’ families and friends come out to the games, their lives are enriched in so many ways, Angela said. Many lifelong friendships are forged at these baseball games. Coaching, umpiring, scorekeeping, watching, supporting, helping – all these activities bring the community closer. Registration for the league is going on now.